Hi everyone, I would like your words of wisdom, before I start a new quilt. I am thinking purple and green, but don't know if it is too boring. Maybe combined with brown and white? Or black? What would you do? Thanks for reading! Those fabrics are lovely, but it depends on what pattern you intend to use. Log cabin would be nice with just these. Do you want sashings between blocks? Do you want a focus fabric? Geometric pattern? Applique? 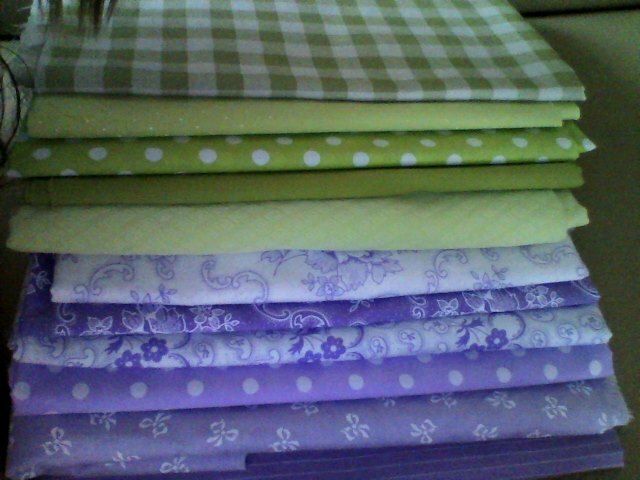 those are all lovely fabrics and will look wonderful together. either white or black will work well. lay the fabrics near these and see how you feel about them. I am going to do English Paper Piecing, 1" honeycombs. The pattern will be Patchwork of the Crosses. Maybe adding a darker green and darker purple fabric makes it more interesting? I like your idea of staying in the colors, but darker, would be really pretty. I love the fabrics but I think you need a color to make them pop! Are you doing sashing or borders.? Purple/mauve/lavender and different greens are one of my favourite colour combos. Your fabrics are lovely! No sashing, not sure about the border yet. I'll have to see how the blocks work out. Thanks for all your kind words and input! Just googled that pattern. Is it Linda Franz Inklingo? Elongated hexagons? I will be lovely in you fabric choices. I really like that pattern. Have fun with it! Ditto! My favorite colors as well. 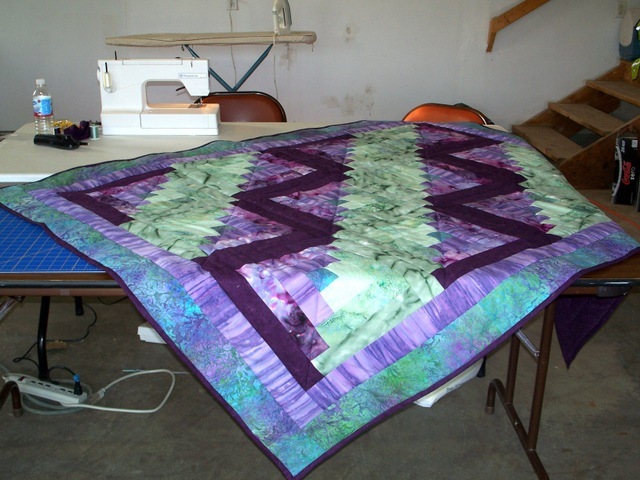 There were 3 colorways the one on the far right was with medium and light fabrics and like ube quilting stated the colors you selected will make a soft and relaxing comfortable quilt. And if that is what you want these will be wonderful and sufficient. If you want something more dramatic and with pop as suggested the first two colorways show some options with a dark also. If you do want the effect of a dark I think a dark purple or green would work better than black or brown. I like the colors you have selected. I wouldn't add more unless you really want to. Beautiful colors and fabrics. They will make a beautiful quilt. I think another color would be nice...What about adding a "touch" of yellow? Beautiful! I love your colors and think some pops of darker tones will work nicely. 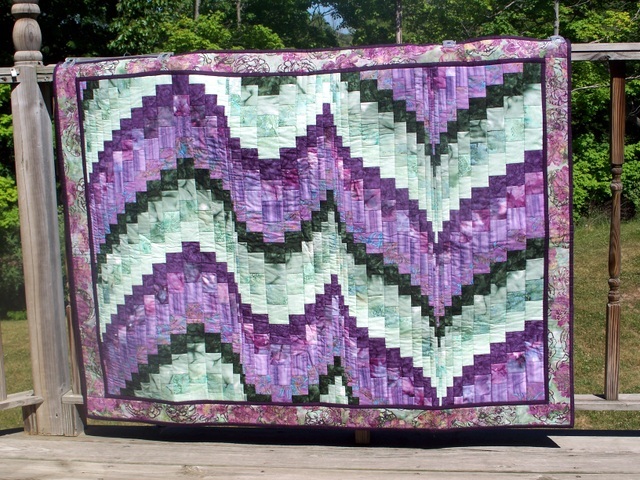 I love the idea of a log cabin with these color fabrics. I think with the white in these fabrics you already have together, you could easily add white. I googled the pattern and saw many of them with the outside white. I think the two colors of greens and lavenders will be gorgeous with a white border. Beautiful pattern and you've put some wonderful fabrics together. Good choices. Perhaps some cream added to the mix would do. I looked at the Crosses pattern, and it's fairly busy. I would add one more darker green with a floral or swirl pattern. The fabrics you'll have then will be perfect. If you want to add white into the mix that will give everything a crisp, fresh look. Please post this when you're done. I bet it will be absolutely lovely! Love purple and green. Here are 2 that I have made w/that color combo. I think turquoise always looks great with green and purple.